St. Martin’s proclaims catholic faith and order within the Church of England. 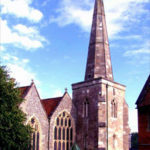 It is the oldest parish in the city of New Sarum, Salisbury. In fact our foundation pre-dates the establishment of the city by at least 200 years.